This package will help you learn about CATARACTS. I HAVE PUT TOGETHER THIS DEVERSE TRAINING DVD FOR A LOT LESS COST. 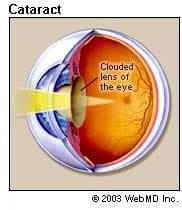 A cataract is a clouding of the lens of the eye that can impair vision. More than half of all Americans age 65 and older have cataracts in their eyes. YOU ARE BIDDING ON A COST EFFECTIVE FANTASTIC MEDICAL TRAINING DVD THAT I HAVE PUT TOGETHER THAT HAS EVERYTHING YOU NEED TO LEARN ABOUT OR TOWARDS YOUR QUEST TO PERFECT BEING A MEDICAL PROFESSIONAL. DID YOU KNOW THAT THE EYE IS SO SENSITIVE, IT CAN DISTINGUISH AMONG 10 MILLION COLORS? FAMILY HISTORY & THE ONSET. IS CATARACT REMOVAL ALWAYS THE OPTION?